Porsche will return to the Le Mans 24 Hours with a full factory LMP1 prototype in 2014, the Stuttgart-based sportscar manufacturer has announced. As the event’s most successful manufacturer, the company has not been represented in a works capacity in the top class at Le Mans since 1998 when Porsche claimed the last of its 16 outright victories with Allan McNish, Stephane Ortelli and Laurent Aiello in the 911 GT1. It has retained a strong presence in the GT class since then, however. President of the Executive Board at Porsche AG, Matthias Muller, said the company had always intended to return to Le Mans as a factory team and had been waiting for the right time to announce its intentions. “Motorsport was always an essential part of the Porsche brand,” said Müller. “So for us it was only a matter of time before we returned as a factory to the top league of racing. Porsche’s last factory involvement in the prototype class was its successful American Le Mans Series-winning LMP2 RS Spyder – which was run and developed by Penske. The company has not released details on the new project, or whether it will be a coupe or an open roof car, but indicated that it wanted to make the most of the Automobile Club de l’Ouest’s inticing approach to green technologies. Hartmut Kristen, Head of Porsche Motorsport, said: “We’re looking forward to the task of developing new technologies and to continue on with the success of the Porsche RS Spyder. After the conclusion of our works-supported sports prototype programme in the American Le Mans Series we have kept up with the latest technological advances. “Now we will begin with detailed research in order to evaluate the various concept alternatives for our new car. Porsche indicated that it could use the new project to highlight new technologies as it did recently with the 911 GT3 R Hybrid, which raced in the recent Nurburgring 24 Hours with the flywheel KERS system developed by Williams. “With the RS Spyder we proved that our motorsport engineers in Weissach are at the forefront,” said Wolfgang Hatz, Board Member for Research and Development at Porsche AG. “For instance, we were the first to run a high-revving race engine with direct fuel injection, DFI, setting new standards in performance and efficiency. Porsche’s run of victories at Le Mans began in 1970 with Richard Attwood and Hans Herrmann in the fabled 917. 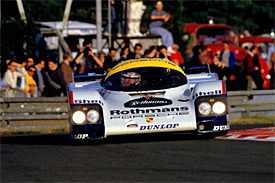 The French track then witnessed the marque dominate through the 1980s, with a consecutive wins from ’81 – ’87, the last six of those with the 956/962 derivatives.